Platelet disorders and inherited or acquired deficiencies of hemostatic factors (eg, factor VIII, factor IX, or von Willebrand factor [vWF]) lead to excessive bleeding, as is widely recognized. Widespread experience with the use of thrombolytic agents in acute myocardial infarction currently indicates that excess plasmin, generated by thrombolytic drugs, increases bleeding risk. However, the fact that a deficiency of alpha2-plasmin inhibitor (alpha 2-PI, a2-PI), a physiologic inhibitor of fibrinolysis, can lead to excessive bleeding is not widely appreciated. In 3 homozygous patients (sisters) from another Japanese family, bleeding was milder, with umbilical bleeding at birth followed by hematomas, gingival bleeding, and epistaxis without joint bleeding. The levels of alpha 2-PI were undetectable in all of the patients. Most reported heterozygous patients did not have clinically significant bleeding, although some had a bleeding disorder. Currently, the reasons for variability in bleeding manifestations in heterozygous persons with alpha 2-plasmin inhibitor deficiency (alpha 2-PI deficiency, a2-PI deficiency) are unclear. Plasmin has a broad range of actions. Plasmin not only degrades fibrin, which is its principal substrate, but it also degrades fibrinogen, factors V and VIII, proteins involved in platelet adhesion (glycoprotein I and vWF), platelet aggregation (glycoprotein IIb/IIIa) and maintenance of platelet aggregates (thrombospondin, fibronectin, histidine-rich glycoprotein), and the attachment of platelets and fibrin to the endothelial surface. A positive feedback mechanism exists whereby plasmin acts to further increase the generation of plasmin by converting Glu-plasminogen to Lys-plasminogen; Lys-plasminogen is more susceptible to activation by plasminogen activators. In addition, other noncoagulation proteins, such as complement, growth hormone, corticotropin, and glucagon, are substrates for plasmin. Therefore, the reasons for the bleeding disorder that develops due to the actions of excess unfettered and unneutralized plasmin are easily comprehended. Alpha 2-plasmin inhibitor (alpha 2-PI, a2-PI) belongs to the serpin family of inhibitors, is synthesized by the liver, and is present in plasma as a single-chain protein in approximately half the concentration of plasminogen. Two forms of alpha 2-plasmin inhibitor (alpha 2-PI, a2-PI) are present in blood; 70% of alpha 2-PI binds plasminogen and has inhibitory activity, whereas the remaining 30% is in a nonbinding form. The nonbinding form is a degradation product of the binding form and has little inhibitory activity. Alpha 2-plasmin inhibitor (alpha 2-PI, a2-PI) reacts very rapidly with plasmin to form a stable plasmin-inhibitor complex. This interaction is central to the physiologic control of fibrinolysis and irreversibly inhibits plasmin activity, which in turn, partially degrades alpha 2-PI. The plasmin-alpha 2-PI complex is cleared more rapidly from the circulation. The half-life of the complex is approximately 12 hours compared with the longer half-life of 3 days for native alpha 2-plasmin inhibitor (alpha 2-PI, a2-PI). Alpha 2-plasmin inhibitor (alpha 2-PI, a2-PI) performs several functions. Alpha 2-PI inhibits free plasmin rapidly and more readily than fibrin-bound plasmin. Alpha 2-plasmin inhibitor (alpha 2-PI, a2-PI) is cross-linked to fibrin, thus conferring resistance to degradation by plasmin, and it interferes with the adsorption of plasminogen to fibrin. As a result, recent clots are more susceptible than older clots to degradation by plasmin. Several other proteins are also involved in the complex process of regulation of fibrinolysis in vivo. Physiologically, the end result is that the hemostatic plug (fibrin and platelet clot) is protected from premature breakdown, leaving the fibrin meshwork intact so that it functions not only in hemostasis but also in wound repair as a scaffold for regenerating cells. As the principal inhibitor of plasmin, alpha 2-PI plays a key role in the physiologic control of fibrinolysis by helping localize reactions to the sites where they are needed and by helping prevent systemic spillover. When the amount of plasmin generated exceeds the capacity of alpha 2-plasmin inhibitor (alpha 2-PI, a2-PI) to neutralize plasmin (since, in plasma, plasminogen levels are twice those of alpha 2-PI) alpha 2-macroglobulin can function as a less efficient backup inhibitor. Note the image below. 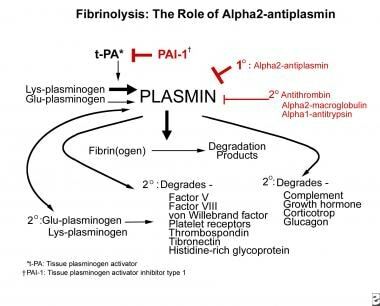 The role of alpha2-plasmin inhibitor (alpha2-antiplasmin) in fibrinolysis. Other inhibitors, such as antithrombin, alpha 1-antitrypsin, and C1 inactivator of complement, have in vitro antiplasmin activity, but these inhibitors may play only a minimal role in vivo. In the absence of alpha 2-plasmin inhibitor (alpha 2-PI, a2-PI), plasmin degrades the primary hemostatic platelet-fibrin plug, thereby interfering with adequate primary hemostasis. Although fibrin formation is unimpaired, subsequent accelerated lysis of the formed fibrin plug (fibrinolysis) leads to the onset of delayed bleeding. In pathologic states, in which there is an endogenous excessive activation of plasminogen or a secondary infusion of activators, such as tissue plasminogen activator (t-PA) and streptokinase, sudden generation of large amounts of plasmin overwhelms the neutralizing capacity of alpha 2-PI. In addition to degrading the primary fibrin-platelet plug, excess plasmin degrades circulating fibrinogen (fibrinogenolysis) and factors V and VIII, adding to the hemorrhagic diathesis. Gene knockout mouse models of alpha 2-plasmin inhibitor deficiency (alpha 2-PI deficiency, a2-PI deficiency) show the expected accelerated clot lysis, but the mice do not manifest the bleeding disorder that is seen in humans. Very few cases of inherited alpha 2-plasmin inhibitor deficiency (alpha 2-PI deficiency, a2-PI deficiency) have been reported; therefore, data do not exist to determine the true frequency. In the next several years, as widespread high-throughput genomic testing becomes commonplace, the frequency of genetic defects will be known, and the frequency of these rare disorders can then be determined. The frequency of acquired alpha 2-plasmin inhibitor deficiency (alpha 2-PI deficiency, a2-PI deficiency) depends on the frequency of the underlying disorders. As discussed in Causes, excessive bleeding can occur when alpha 2-PI levels are deficient. Homozygous patients with alpha 2-plasmin inhibitor deficiency (alpha 2-PI deficiency, a2-PI deficiency) have severe bleeding that requires plasma therapy to limit the bleeding and to maintain plasma levels until the acute bleeding resolves. Patients with an inherited homozygous alpha 2-plasmin inhibitor deficiency (alpha 2-PI deficiency, a2-PI deficiency) have a clinically significant bleeding disorder characterized by easy bruising, delayed onset of bleeding following trauma or surgery, menorrhagia, epistaxis, hematuria, and bleeding into joints, similar to the manifestations seen in patients with hemophilia. The frequency of a bleeding disorder reportedly varies among patients who are heterozygous for alpha 2-PI deficiency and is characterized by a milder bleeding disorder in most heterozygotes, with a tendency to worsen with age. The bleeding in patients with acquired disorders associated with alpha 2-plasmin inhibitor deficiency (alpha 2-PI deficiency, a2-PI deficiency) is described in Causes. No ethnic predilection for alpha 2-plasmin inhibitor deficiency (alpha 2-PI deficiency, a2-PI deficiency) is known at this time because the overall number of reported cases is so small. Alpha 2-plasmin inhibitor deficiency (alpha 2-PI deficiency, a2-PI deficiency) is inherited as an autosomal recessive trait. Clinical manifestations of alpha 2-plasmin inhibitor deficiency (alpha 2-PI deficiency, a2-PI deficiency) may start at birth, with excess bleeding from the umbilical cord. Bleeding manifestations may start later in childhood, when trauma and minor cuts occur with increasing activity. Menorrhagia manifests following puberty in women. Koie K, Kamiya T, Ogata K, Takamatsu J. Alpha2-plasmin-inhibitor deficiency (Miyasato disease). Lancet. 1978 Dec 23-30. 2(8104-5):1334-6. [Medline]. Kluft C, Vellenga E, Brommer EJ, Wijngaards G. A familial hemorrhagic diathesis in a Dutch family: an inherited deficiency of alpha 2-antiplasmin. Blood. 1982 Jun. 59(6):1169-80. [Medline]. [Full Text]. Bachmann F. Plasminogen-plasmin enzyme system. Colman RW, Hirsh J, George JN, et al, eds. Hemostasis and Thrombosis: Basic Principles and Clinical Practice. 4th ed. Philadelphia, Pa: Lippincott Williams & Wilkins; 2001. 275-320. Bachmann F. The fibrinolytic system and thrombolytic agents. Bachmann F, ed. Fibrinolytics and Antifibrinolytics. Berlin, Germany: Springer-Verlag; 2001. 3-15. Francis CW, Marder VJ. Physiologic regulation and pathologic disorders of fibrinolysis. Colman RW, Hirsh J, George JN, et al, eds. Hemostasis and Thrombosis: Basic Principles and Clinical Practice. 4th ed. Philadelphia, Pa: Lippincott Williams & Wilkins; 2001. 975-1002. Rijken DC, Abdul S, Malfliet JJ, Leebeek FW, Uitte de Willige S. Compaction of fibrin clots reveals the antifibrinolytic effect of factor XIII. J Thromb Haemost. 2016 Jul. 14 (7):1453-61. [Medline]. [Full Text]. Rijken DC, Uitte de Willige S. Inhibition of Fibrinolysis by Coagulation Factor XIII. Biomed Res Int. 2017. 2017:1209676. [Medline]. [Full Text]. Castellino FJ, Ploplis VA. Plasminogen and streptokinase. Bachmann F, ed. Fibrinolytics and Antifibrinolytics. Berlin: Springer-Verlag; 2001. 26-56. Abdul S, Leebeek FW, Rijken DC, Uitte de Willige S. Natural heterogeneity of α2-antiplasmin: functional and clinical consequences. Blood. 2016 Feb 4. 127 (5):538-45. [Medline]. [Full Text]. Hedner U, Hirsh J, Marder VJ. Therapy with antifibrinolytic agents. Colman RW, Hirsh J, George JN, et al, eds. Hemostasis and Thrombosis: Basic Principles and Clinical Practice. 4th ed. Philadelphia, Pa: Lippincott Williams & Wilkins; 2001. 796-813. Bachmann F. Disorders of fibrinolysis and use of antifibrinolytic agents. Beutler E, Lichtman MA, Coller BS, et al, eds. Williams Hematology. 6th ed. New York, NY: McGraw-Hill; 2001. 1829-40. Davis R, Whittington R. Aprotinin. A review of its pharmacology and therapeutic efficacy in reducing blood loss associated with cardiac surgery. Drugs. 1995 Jun. 49(6):954-83. [Medline]. American Red Cross. PLAS+SD (pooled plasma, solvent-detergent treated) (monograph). 1999. PLAS+SD (Pooled Plasma, (Human) Solvent Detergent Treated) [package insert]. Washington DC: American Red Cross, VI Technologies, Inc. October 2000. MediView Express. Recombinant therapy enhances safety and quality of life for hemophilia patients. Paper presented at: 53rd Annual Meeting of the National Hemophilia Foundation. November 16, 2001; Nashville, Tenn.
Dale GL, Friese P, Batar P, et al. Stimulated platelets use serotonin to enhance their retention of procoagulant proteins on the cell surface. Nature. 2002 Jan 10. 415(6868):175-9. [Medline]. Favier R, Aoki N, de Moerloose P. Congenital alpha(2)-plasmin inhibitor deficiencies: a review. Br J Haematol. 2001 Jul. 114(1):4-10. [Medline]. Hanss MM, Farcis M, Ffrench PO, de Mazancourt P, Dechavanne M. A splicing donor site point mutation in intron 6 of the plasmin inhibitor (alpha2 antiplasmin) gene with heterozygous deficiency and a bleeding tendency. Blood Coagul Fibrinolysis. 2003 Jan. 14(1):107-11. [Medline]. Lijnen HR, Okada K, Matsuo O, Collen D, Dewerchin M. Alpha2-antiplasmin gene deficiency in mice is associated with enhanced fibrinolytic potential without overt bleeding. Blood. 1999 Apr 1. 93(7):2274-81. [Medline]. [Full Text]. Maino A, Garagiola I, Artoni A, Al-Humood S, Peyvandi F. A novel mutation of alpha2-plasmin inhibitor gene causes an inherited deficiency and a bleeding tendency. Haemophilia. 2008 Jan. 14(1):166. [Medline].